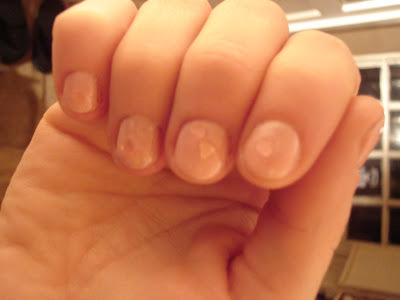 This weekend was a horrible weekend for my nails. My polish started chipping on friday, but I didn't have time to replace it, by sunday a bunch of my nails had breaks (a combination of doing laundry and the super cold weather we've been having) So I've filed them all to match the worst break, and they're super short. I'm almost too embarrased to post pics of my mani, but I liked the idea albeit on short nails. This is two coats of sally hansen xtreme in first blush, topped with one coat of a maybelline polish with pink hearts in it.